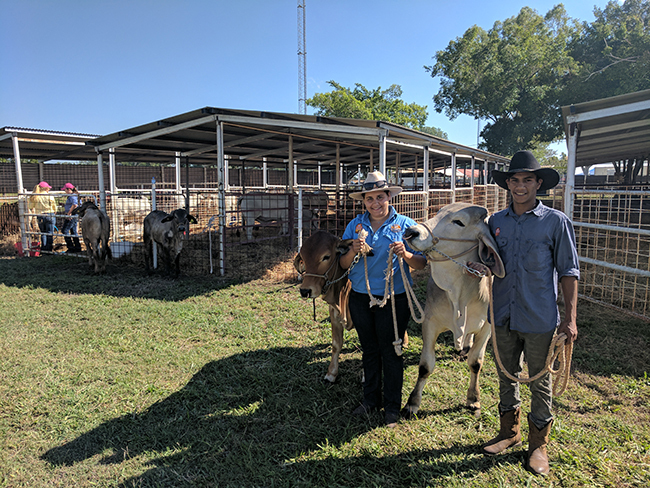 Students from five Territory schools presented their prize-winning cattle at the Katherine and Darwin Shows as part of the Pastoral Futures Program. More than 100 students from Centralian Senior College, Yirara College, Tennant Creek High School, Katherine High School and Taminmin College are involved in the Pastoral Futures Program, which sees students learning about the pastoral industry as part of their senior studies. As part of the program students undertake either a Certificate I in Agrifoods, Certificate II in Rural Operations or Certificate III in Agriculture which gives students skills associated with working on a modern pastoral property. The program creates pathways for students to enter the pastoral industry through work placements conducted on stations or properties, which includes handling horses and cattle and learning first aid. Director of Industry, Engagement and Employment Pathways Andrew Oliver said the program, now in its fourth year, was developed to attract young people to work in the pastoral industry to replenish an ageing workforce. “This program not only benefits the students by giving them hands-on skills, it also allows them to have a direct link to employers through our industry partners,’’ he said. “The program gives students pathways not only in the pastoral industry but also subsidiary industries, such as animal nursing or veterinary services. Centralian Senior College student Mariah Satour said the program was great for Indigenous students that were unsure of what they wanted to do in the future and wanted to learn something new. “I enjoy the hard work, I enjoy the small things that come out of the big things and I enjoy just working with the animals. I love everything about it,’’ she said.